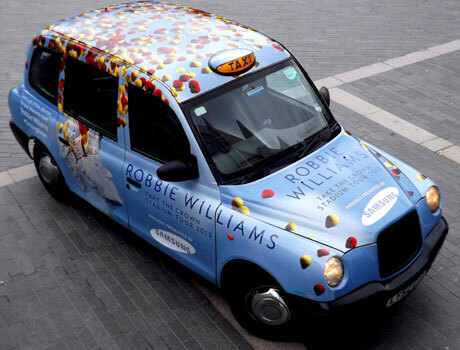 Samsung has launched a campaign to give Robbie Williams fans the chance to meet the star by simply tapping NFC tags located in black cabs in three UK cities. For the campaign, run by VeriFone Media in partnership with NFC vendor Tapit, taxi cabs are being redecorated with promotional imagery for the singer’s Take the Crown tour and TV screens are being installed inside the rebranded cabs to show exclusive backstage footage of a previous tour. Every 30 seconds a call to action appears on-screen that prompts viewers to tap their phone against one of the NFC stickers located on either side of the cab’s interior. When they tap, fans are directed to the competition web page where they can enter a draw to have the chance to meet Robbie Williams and win tickets to the gigs. The promotion is now live in fifteen London taxis and will be rolled out to eighty cabs around the city as well as to cabs in Manchester and Glasgow.